After hacking and taking down social media accounts of ISIS members, the online Hacktivist group Anonymous is back again with its new plan to harass the Islamic State (IS) militant group that was behind the horrific terror attack in Paris. 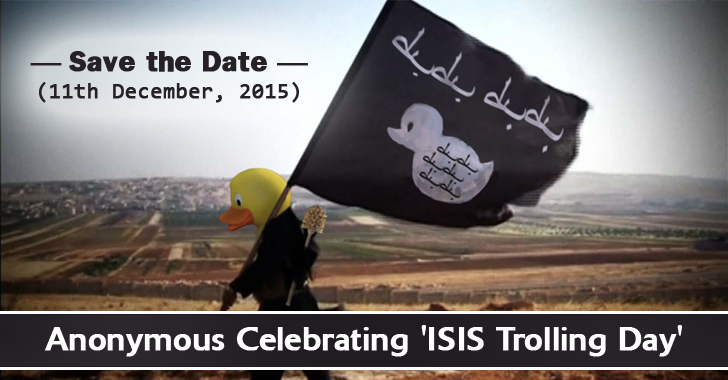 Now, the hacktivist group has declared December 11th to be "ISIS Trolling Day," planning an organized trolling campaign against ISIS by assaulting their image through Photoshopped images, memes, videos and jokes related to the terrorist organisation. This campaign is also part of the group's ongoing effort to disrupt and dishonor the ISIS terror organization's online presence. Western-living Muslims usually fall for ISIS' intimidating social media propaganda, so rebranding the militant group as a joke may be one of the best ideas Anonymous hackers ever had – attacking the ideas that ISIS is trying to spread online. Anonymous has also asked netizens to be part of this trolling campaign as an effort to mock ISIS members and supporters for "the IDIOTS they are." According to a Ghostbin post, the trolling campaign will take place on Twitter, Facebook, Instagram, YouTube, and in the real world. "We'll show them what they really are they don't stand for a religion, they don't stand for a God, they're brainwashers teaching from the young to the old their propaganda against the 'West' when in reality they're just increasing the distance between countries by giving many a bad name," the post reads. Now, let's see what kind of real impact this campaign will make at the end of the day, but free speech and taunt can be a way more powerful tool when fighting a war of ideas.